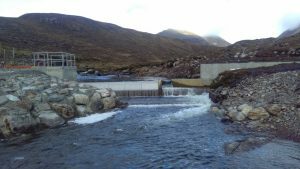 The Western Isles Hydro Power Feasibility Study, commisioned by Community Energy Scotland in 2008 highlighted two water systems in North Harris that were deemed worthy of further study. The first scheme is at Bunavoneadar, where the remnants of an old hydro system still exist. The dam and iron pipework which are still clearly visible, powered a turbine at the Old Whaling Station on the shore. 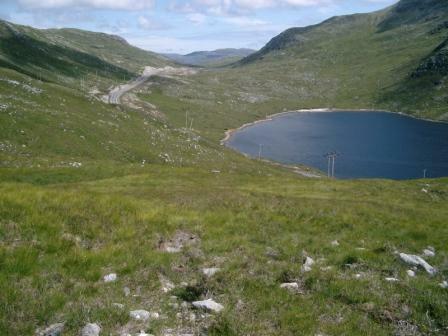 The second scheme is a stored water project based on the Loch na Ciste system which runs alongside the main A859 road near the Ceann an Ora quarry. The catchment area is not large, but the high annual rainfall and the 120m head counter this factor. Both projects could power turbines of around 150kw size. 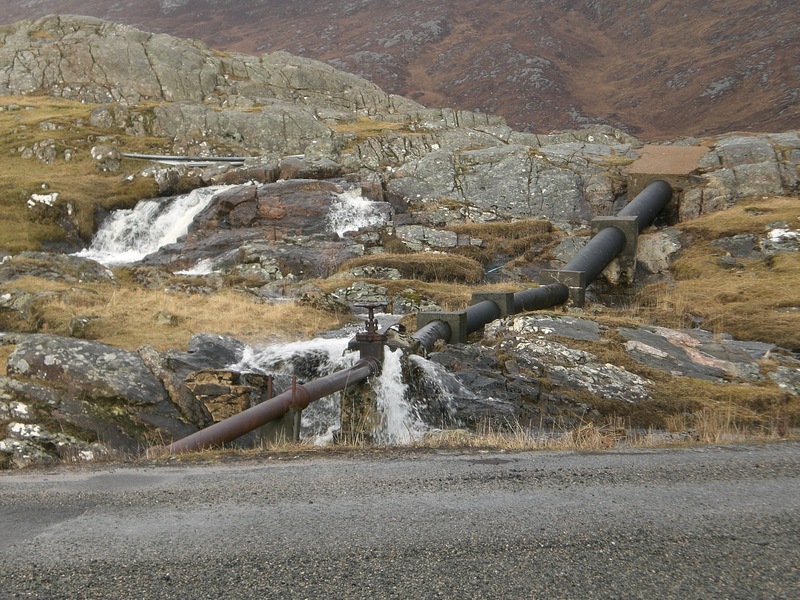 It was decided to progress the Bunavoneader scheme as the Loch na Ciste scheme required significantly more work to install the long penstock pipe in solid rock. On June 17th 2009 Fairhurst, the Civil Engineers had their first site visit. 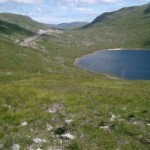 They won a competitive tender to take a batch of community hydro projects through to planning application stage. In March 2010 we invited local households to an open evening at the Harris Hotel. All the plans were on display. The response was overwhelmingly positive. After a review of the various options, the Trading Company decided to take forward the smaller of the two Bunavoneader schemes. This includes the construction of an intake weir just upstream from the old dam and a turbine house below the road bridge. The planning application was approved in August 2010, following surveys for migratory fish, otters and mussels. The Grid Connection application was accepted in September. In October, an invitation to tender was issued to a dozen companies for the construction. Ross-shire Engineering, were chosen as our construction partner. Conversations took place with a number of potential funders to build a suitable funding package. The shape of this has changed significantly since the project outset. No longer can we use public grant funding if we wish to access the Feed-in-Tariff scheme that pays for the generation of green energy. During the summer of 2011, we thought the finances were in order. The majority of funding was coming from the Co-op Bank, the remainder from the Bank of Scotland. In Autumn the UK government started the first review of the Feed-in-Tariff scheme. The second part of the review, which looked at hydro-electric generation was eventually delivered in the summer with no change to hydro rates. In the mean time though, Bank of Scotland has decided it won’t lend on hydro of any type and SSE decided not to connect us until the interconnector is laid under the sea; 2021 is the best guess at present. In late 2013, SSE had a change of heart. A variation offer arrived quoting a connection date of August 2014, starting the search for funding once more. In 2015 we formed a Joint Venture company with Sustainable Technology Investors Limited, a financier. Despite owning a minority share, the scheme is now built, and locked into the Feed in Tariff (that pays you for generating green energy) before it is degressed further. The Trust has first option on purchase when the scheme comes to market. The 11 month construction programme commenced in July 2015. The intake was completed before the worst of the weather arrived. Spring 2016 saw the turbine house built. 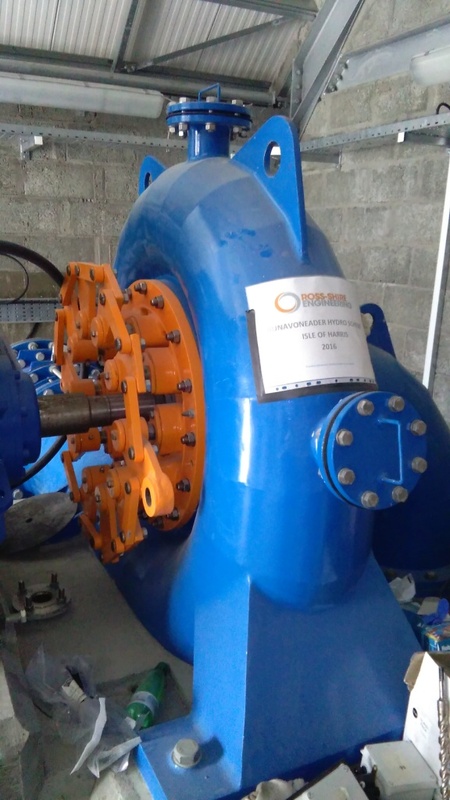 The 100kW Francis turbine was installed in May, with commissioning in July. In 2013 we were awarded OHCEF funding for a Feasibility Study on the Maraig river. The water treatment works had become redundant – allowing water to be taken from the river for a hydro-electric scheme. The report was delivered at the end of 2013 and stated that there was potential for a 350kW scheme. Electricity Grid constraints forced us to design a 50kW scheme with expansion capacity. In 2014, we completed the environmental survey work and secured planning application. All other permissions were in place and we were talking to a potential backer to finance the construction – then SSE dropped the bomb-shell. The Western Isles grid is full. There will be no new connections for generators. So despite having a paid-up connection agreement, the project cannot be built until the new under-sea cable is installed to export electricity to the mainland. The earliest this could happen is 2022, although there is still no firm commitment. The Trust asked SSE to refund its grid deposit. This was received after a further 6 month, minus the obligatory Admin Fee. 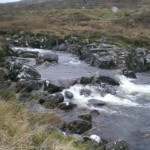 In addition to the above “small” hydro schemes, North Harris Trading Company commissioned “micro” hydro feasibility studies on a number of rivers. A number of smaller streams were investigated. Two in particular were selected to progress. 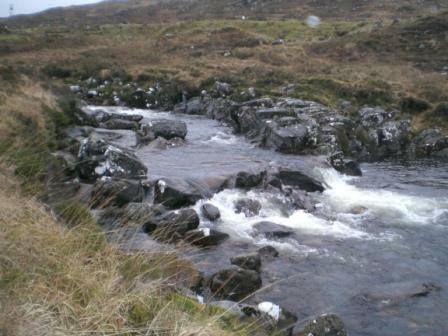 The study highlighted streams at Govig and Kyles Scalpay as having suitable water resource and grid availability to develop. Designs and costings for both schemes were drafted by IT Power Limited. The resulting report was delivered in December 2010 however the Trust took the decision not to progress these schemes. Not a comment but a query: the British Hydro Association suggested asking you. We are working here on a 100kW project on the river Thames, on land the belongs to the District Council. We are a Benefit of the Community co-operative and the council man asks if I can give examples of the rent paid by community groups. He is sympathetic to charging a low rent (the land is part of a public park and has no other uses), but he needs evidence for his superiors. But looking at your web site I guess you have not got to the stage of agreeing a rent? The North Harris Trust is the land-owner, so it’s different to your situation. We have engaged a surveyor to value the development and suggest a rent. In crofting counties like ours, the rent is split between the landlord and the crofter.